Quickly and easily send photos wirelessly from your Wi-Fi & NFC enabled COOLPIX AW130 to a compatible smartphone or tablet±. Share your great photos on the go, even in remote locations, or use a smartphone or tablet to control your camera. There’s nothing worse than a shaky handheld video. As soon as you start recording with COOLPIX AW130, Hybrid VR (Vibration Reduction) activates and combats camera shake for sharper steadier home movies. It's frustrating when a smartphone camera focuses on the wrong thing. With COOLPIX AW130, Target Finding AF quickly determines your intended subject and puts the focus where it belongs—on your subject. More creativity at your fingertips—even if your fingertips are enclosed in ski gloves! The COOLPIX AW130's handy Action Control feature makes it easy to adjust specific camera settings. Wrapped up in the action with no time to change settings? 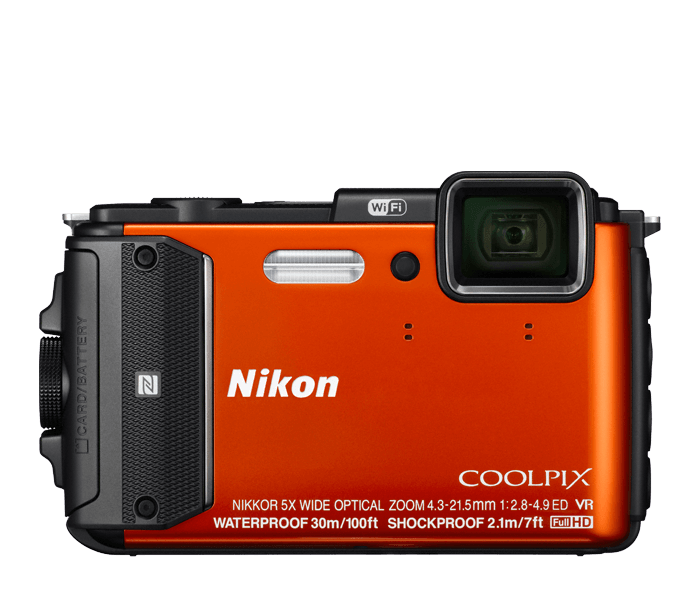 The COOLPIX AW130 automatically adjusts camera settings. And if you're looking to add creativity, select in-camera effects such as black and white, or selective colour. There's even an underwater mode to keep images colourful and properly exposed.